Remember to donate to our End of Year fundraiser and support our community and its work. It's the time of year for recaps. We already talked about the advancements in KDE's software, and it makes sense we talk about that first. To many people and for many years, "KDE" was synonymous with a desktop environment and its applications. That is, KDE was its software. 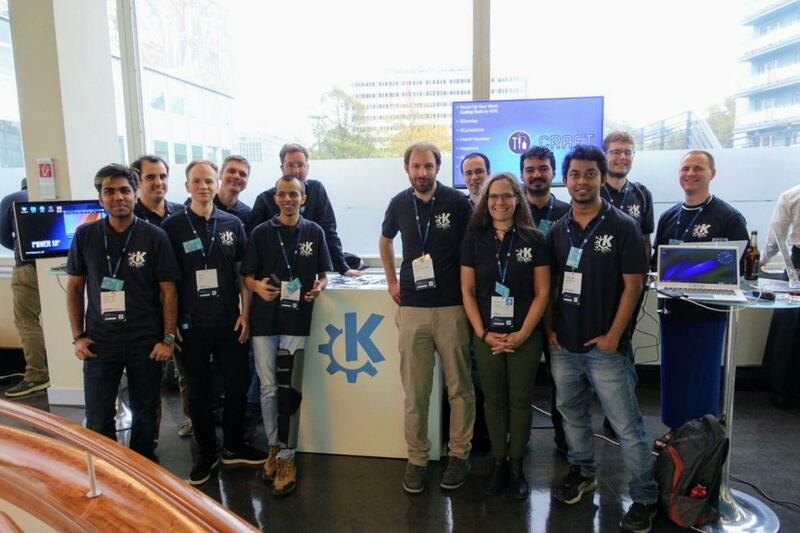 New developers and students were brought into the KDE fold in 2017. We showed them how to start contributing to Free Software, opened up career opportunities for them, and helped them realise their full potential. Among other things, this year we sponsored 24 students who have participated in the Google Summer of Code. Their projects ranged from developing new tools for existing apps, like the new heal tool to remove dust and scratches from photos added to DigiKam, or the possibility of exploring indoor plans to Marble; to improving libraries to adapt to new technology, like the library that allows KDE apps to make the most of High-DPI monitors, or the Brooklyn bridge that allows Instant Messaging users to communicate with other users using different IM systems. KDE also sponsored developers and supporters to allow them to visit events far from their homes. We helped Lays Rodrigues from Brazil get to the developer sprint we run every year in Randa, Switzerland. Lays is working on Atelier, a graphical interface for controlling 3D printers. A sponsorship for Anu Mittal (a software engineer) and Vasudha Mathur (a student software engineer) allowed them to make it to Akademy in Spain all the way from India. 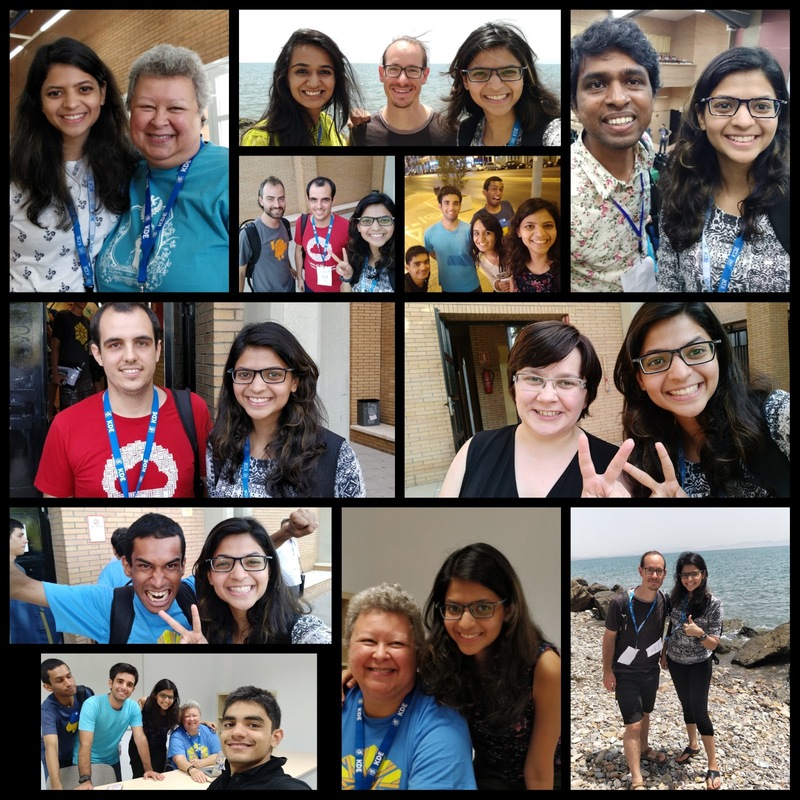 Anu is a contributor to several applications in KDE's educational suite of programs, and Vasudha is writing a Qt interface to Rocket Chat, a free, open source team chat system for enterprises. Vasudha's implementation will work both on desktop and mobile devices. This year the KDE community met in full force in August in Almería, in the south of Spain. Akademy provides all KDE contributors the opportunity to meet in person to foster social bonds, work on concrete technology issues, consider new ideas, and reinforce the innovative, dynamic culture of KDE. Akademy brings together artists, designers, developers, translators, users, writers, sponsors and many other types of KDE contributors to celebrate the achievements of the past year and help determine the direction for the next year. This year's event attracted over 110 attendees travelling mainly from Europe, but also from North and South America, and Asia. Over the weekend, visitors were able to attend more than 40 different talks on all kinds of topics, ranging from developing applications for mobile phones to best ways for collaboration between communities. And then, thanks to our sponsors and donations from community members, KDE developers assembled again in Randa, Switzerland, ready to tackle the challenges of accessibility. Voice feedback and keyboard navigation got added to Plasma, Marble got smoother and developers started working on a better text-to-speech engine for the mapping app. The developers also discussed accessibility best practices and decided testers should check if an app can be used only with the keyboard and then only with a mouse. They also agreed that customizations should be kept to a minimum. In summary, KDE developers made everything better for everybody. The Qt World Summit (QtWS), held in Berlin in October, was a meeting of another kind altogether. Our target at this event was to convince people from enterprises and a wider developer community to Power Up using KDE-based libraries and framework. Visitors could try Plasma Mobile working on an actual handset, and also play with the upcoming Pinebook, a Plasma-enabled ultra-notebook built around the Pine 64 SBC. Attendees could also recharge literally, relaxing at our ample sitting space with comfy cushions in an open and informal atmosphere, while topping up the batteries of their devices with the plugs and USB charging stations strategically placed all around the sitting area. Our aim was to make visitors feel welcome not only to our booth, but also to our community. We supported the cause for a wider adoption of Free Software in several ways during 2017. We partnered with Purism to work on getting Plasma Mobile ready for their Free smartphone, Librem5. We are proud that KDE's early participation in the crowdfunding campaign was instrumental in pushing it over the finishing line and then some. Not only did we help them surpass their initial goal of $1.5 million and then reach 2 million dollars, but we also precipitated a flurry of endorsements from other Free Software projects, such as Gnome and Monero. 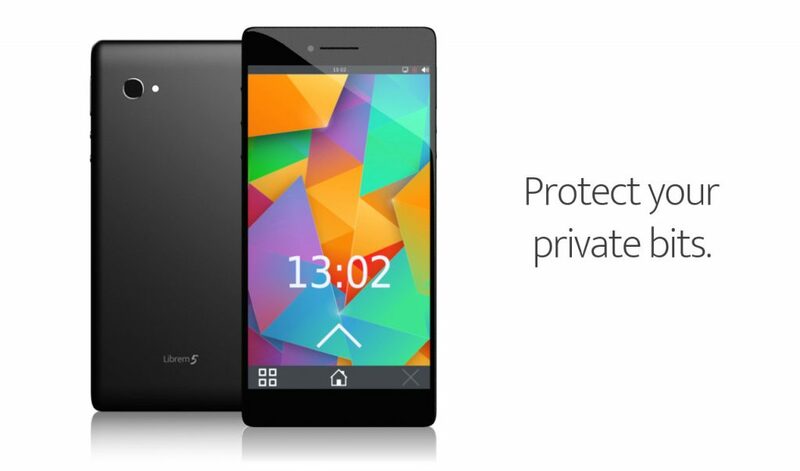 The end result is that a fully open and privacy-respecting Linux-based phone is much nearer than you think. And then we helped the Free Software Foundation Europe campaign push for increased adoption of Free Software in public institutions. The Public Money? Public Code! campaign advocates for software developed using public funds to be released and shared under Free Software licenses. We raised awareness by blogging about it, and published an article about the campaign here, in the Dot. We then spread the news through our social media accounts. of meeting new people in 2017. It has been a good year for growth of the KDE community. 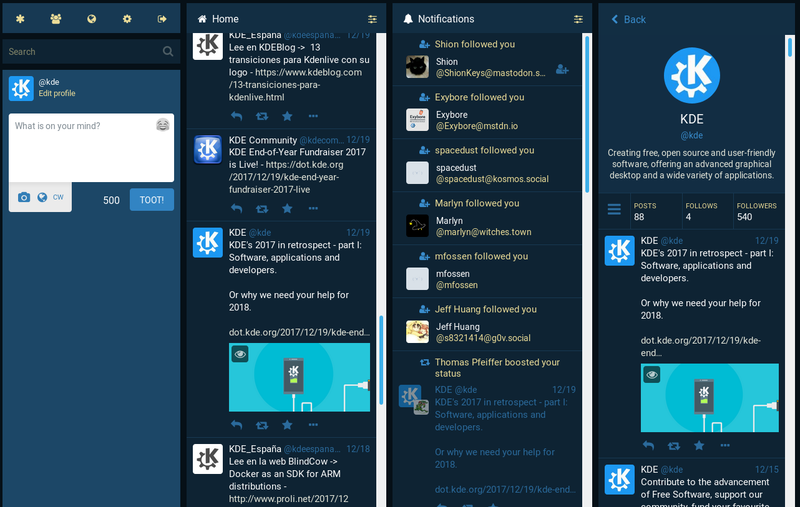 We have ramped up our activity on social media to help more people become aware of the benefits of Free Software in general, and of KDE environments and applications in particular. Our Twitter following has swelled to well over 51,000 users, and our subreddit now has more than 10,000 subscribers. This is a massive audience that re-tweets, comments and posts about what we do, helping us reach an evergrowing audience. We have also increased our presence on Facebook and G+. But probably the most interesting social network we started using in 2017 is Mastodon. We created our account on this free and federated microblogging network back in July, and have seen our audience grow along with the service itself. We are currently averaging 17 new followers a week and have recently surpassed the 500 mark. Thanks to these outlets, we get to talk to more and more people every day. Our social media accounts allow for a two-way conversation with users we would otherwise never hear from. Although it may sound trite, the long and short of it is that KDE nowadays is more about people than about writing code. Of course, we love our software and adore the talented developers, but we see beyond developing apps and environments. We consider our technology a force for good; a way to help bring usable, accessible and powerful software to the people. Over the years, we have discovered that we need more than excellent developers to do that. We need a whole community willing to contribute a wide variety of skills, technical and otherwise. Fortunately, KDE has managed to build a strong community, and it is thanks to you and people like you. None of the above milestones would have been possible without your support and your contributions. You can help us even more by donating to our End of Year fundraiser or by spreading this article far and wide, raising awareness of the work we all do together. Thank you because you made 2017 wonderful, and thank you again because we know you'll make 2018 even better.